A product from: AMT Apex Material Technology Corp.
What Challenges Are Posed by an Industrial Environment? Reliability is the foremost concern for IPCs. PCAP touch panels in IPCs are normally surrounded by requisite equipment such as transformers, control motors, robot arms, etc. These devices generate high voltage and noise interference in different frequency bands. In addition, poor grounding design will also generate high noise interference, IPCs must pass a number of safety certifications, and operators frequently need to wear gloves during operation. 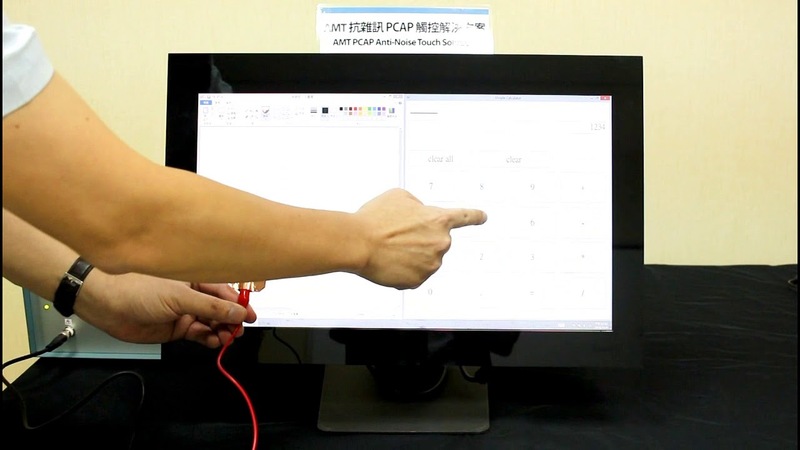 How reliable are AMT Industrial PCAP Touch Panels? The signal generator outputs 150V 8kHz low frequency noise interference to simulate noise from a control motor. When this signal is applied to the two display units, the unit with PenMount noise handling technology can be operated normally and is not influenced by the interference. False touches can be seen on the other unit. AMT PCAP touch panels utilize noise filter hardware to eliminate most noise interference in high frequency bands and SNR for signal detection to allow the control board to differentiate noise interference and touch signals in a timely manner. Then, PenMount’s proprietary frequency hopping algorithm automatically selects the most suitable operating frequency to enhance anti-noise interference performance. Standard AMT touch products support operation while wearing a wide selection of glove types to protect operators from machines and the environment. A harsh environment also means that the touch panel itself may need to be ruggedized. AMT touch panels support a number of cover lens thicknesses from 4mm, 6mm, to a maximum of 10mm for the best impact resistance. Founded in 1998, AMT is committed to the development and innovation of resistive and projected capacitive (PCI or PCAP) total touch solutions. With our headquarter based in Keelung, Taiwan and a subsidiary located in Milwaukee, Wisconsin, we design and manufacture advanced high-performance touch products for industrial and medical applications. Customers come to AMT for our great product quality, reliability, durability, and immediate support services. AMT’s unique value lies in its ability to fulfill the disparate needs of customers. The high quality of AMT’s products and the flexibility of production are core competencies that help us maintain a leading position in the market. Whatever the needs of your project, we can build a custom solution for you. AMT is in a class all its own. We are the only company in the world that manufacturers both proprietary touch sensors and proprietary touch controllers. From LCD bonding to décor glass printing, from controller to sensor, only AMT can offer you a truly all-inclusive touch module with all components represented by one part number. Furthermore, AMT’s support and services team is a group of professionals with years of experience in handling a diverse client base. We understand the needs of customers and reflect our understanding and expertise in the products and services we provide.